Did your dryer unexpectedly call it quits? Or maybe you’re looking for an upgrade to your old and worn-out stove. 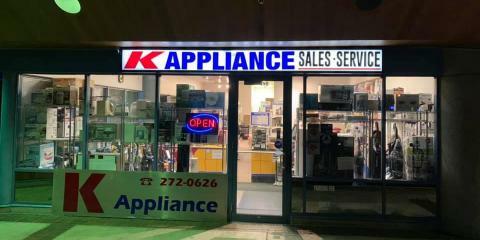 K Appliance in Anchorage, AK, specializes in household appliances and repairs. With over 42 years of experience, they’re qualified to advise you on what model will be best for your specific needs and budget. This store offers both residential and commercial major appliances, stocking equipment from industry-leading brands to ensure high performance and longevity. Choose from a wide and diverse selection of new and used household appliances, featuring: Refrigerators and freezers Washers and dryers Stoves, ovens, and hoods Vacuums and carpet cleaners They also repair household and kitchen appliances, carrying a large stock of the most common parts. Benefit from the knowledgeable staff and vast selection of household appliances at K Appliance. Call (907) 272-0626 or visit them online for more information today.